Rafael Hernandez exemplifies the spirit of community engagement that has been a guiding principle of MedMar Healing Center from day one. In addition to running marathons, Hernandez and others at MedMar have organized blood drives, removed trash from area waterways, and collected canned food for the local homeless population. Over the last two years, Hernandez has participated in three marathons, raising a total of $8,000 for the society on behalf of MedMar. "Part of the mission of MedMar Healing Center is to make positive contributions to the community. We believe in setting a positive example for our industry. MedMar Healing Center staff are pleased to announce that one of the dispensary’s co-founders, Rafael Hernandez, has invested a generous share of "sweat equity" in the Leukemia and Lymphoma Society (LLS). Over the last two years, Hernandez has participated in three marathons, raising a total of $8,000 for the society on behalf of MedMar. LLS (http://www.lls.org/) is the largest medical nonprofit addressing blood cancer research and education services. Hernandez worked with LLS's Team in Training, a program that help participants prepare their bodies and minds for the rigors of endurance sports. Since 2011, he has finished three marathons—two in San Diego and one in Chicago. The broad support of MedMar's members and the community at large have enabled this successful fundraising initiative. "Part of the mission of MedMar Healing Center is to make positive contributions to the community. We believe in setting a positive example for our industry. After all, philanthropy is not only good for people, it's good for business as well. Being a part of Team in Training has set that example," explained Hernandez. 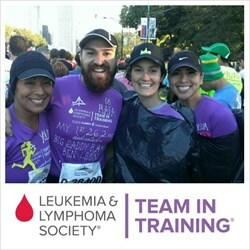 For 25 years, Team in Training (http://www.teamintraining.org/) has worked tirelessly to raise money for the Leukemia and Lymphoma Society. The organization has prepared 570,000 amateur athletes to take part in marathons, triathlons, cycling and hiking events, raising over $1.4 billion for cutting-edge cancer research. Participants are connected with local certified coaches, and mentors are available for help with fundraising; participants can even set up their own website to raise money and awareness online. Hernandez added: "MedMar's membership includes cancer survivors, as well as those still battling the disease and enduring treatments. We see their struggles up close. So for me, raising money for LLS is personally and spiritually fulfilling. Ultimately, I hope my modest contribution and active participation with Team in Training make a difference in people's lives." MedMar has a laudable tradition of working for the betterment of the local community and engaging its members in these efforts. The dispensary has organized two blood drives in the last two years, recruiting hundreds of donors; this year's drive collected 79 pints of blood, enough to save 201 lives. Additionally, the staff has collected thousands of pounds of canned food for the homeless, as well as removed truckloads of garbage from Los Gatos Creek. Meanwhile, Hernandez's work with Team in Training has allowed him to travel the country, network with like-minded individuals, and raise the profile and reputation of MedMar Healing Center. MedMar Healing Center is a grassroots, community-based San Jose dispensary that offers support and alternative health resources to patients facing health challenges. Our primary goal is to advocate a proactive approach to health management by providing a local, affordable, and safe environment to dispense medical marijuana and other alternative health services.